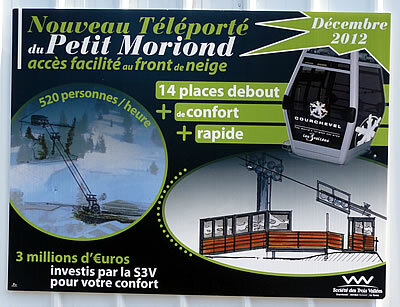 Update Dec 2012: New Lifts for La Tania - also see the Courchevel Mountain Plan from May 2012. 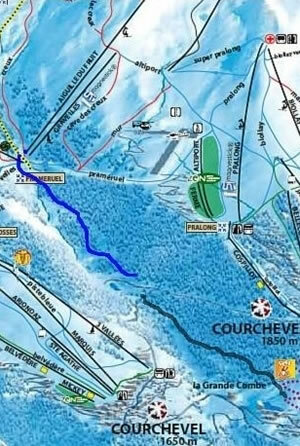 The Courchevel Master Mountain Plan has been released detailing plans for the next 10 to 15 years. There are 16 new lifts proposed, some new pistes and many old lifts to be removed – lots more in the Courchevel Valley section. The replacement of the Biollay quad chair with a Hi-Speed detachable 6-pack in 1850. 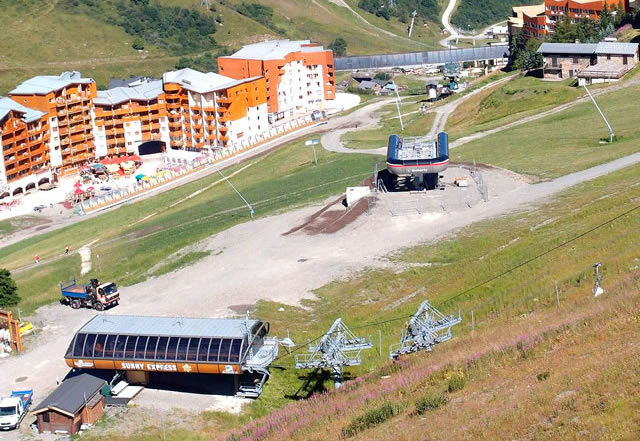 A new access gondola in 1650 plus the removal of the old 3 Vallees Chair. The Saulire Express 1 gondola replacing the (Burgin) Saulire 1 bubble in Méribel to join up with the Express 2 lift completed last season. Replacement of the Plattieres 1 and 2 bubbles with a new single 10 seater gondola. Plattieres 3 remains. A new quad chair in Les Menuires replaces the old Reberty bucket lift for fast access from La Masse to Sunny Express & Bruyeres lifts. Further details of all these in the relevant sections below. New for next Winter is a discount if 3 are more passes of the same type, dates and duration (min 6 days) are bought together. The “Tribu” discount works out around 7% for single valley passes or nearer 6% on 3 Valleys passes. It does include Season Passes so 3 x 3 Valley Season passes bought together would save €195. The family pass is re-worked so all pay the same price from 2 to 7 children skiing with 2 parents. Again they must be of the same type, dates and duration (min 6 days) and bought together. Note that kids in this instance are under 18 rather than under 13 for a “normal” kids pass. So 2 adults with four kids who are 13 and buying 6-day 3 Valleys passes pay €1248 with a family pass rather than €1560 – a saving of €312. The new law around carrying a breathalyser test kit came in on 01 July 2012 although will not be enforced until 01 November 2012. They cost around £6 for a twin-pack from Halfords etc or available on-line here . Rumours of spot checks on UK registered cars are circulating of course but the chances are if you stay out of trouble in the first place you'll generally not be bothered by the French Police. Update 17/10/2012: French authorities have announced that the law will not be enforced until March 2013 and the offence will carry a €11 fine. Roadworks continue around the approach to the departures area of Geneva Airport, make sure you get in the correct lane early. The illuminated red line (new last Winter) instead of a barrier where people come out of baggage reclaim continues to work amazingly well keeping everyone stood back! Note that the Geneva Airport Arrival Parking is to be moved down a level for most of the Winter Season 2012/2013 (marked as level -1 in the lifts). This is to allow the continuation of work improving airport access and the whole parking area. Note that there is a height limit of 2 metres to access this car park, higher vehicles will be directed towards the minibus parking towards the Expo Arena (departure parking may be another option of course). They’ve managed to put in yet another 2 roundabouts between Ugine and Lake Annecy. Oh and in Annecy my favourite Italian Restaurant has changed hands and become part of the Hippopotamus restaurant chain. 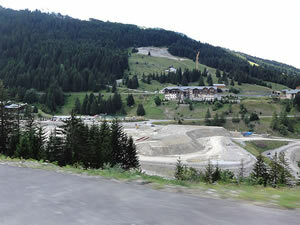 There is a new speed bump on the approach to Le Praz and a chicane system around the work going on at the Ski Jump there (but hopefully they’re only there for Summer). 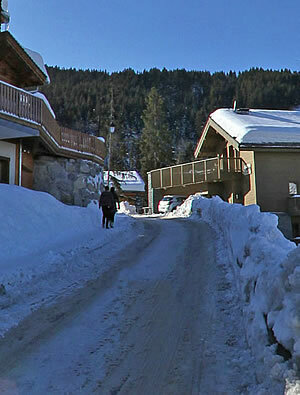 The road up to the chalets in La Tania has been re-laid – see the La Tania section. Some less frequent flights option next year with some routes only operating at the weekend and it looks like the end for bmiBaby while SnowJet will only operate charters for package deals next Winter. No flights to any nearby airports announced by Ryanair either. Monarch however have announced their return to the ski market with flights to Grenoble from Birmingham (Thu/Sat/Sun), Leeds (Mon/Thu/Sat), Manchester (Mon/Thu/Sat) and Gatwick (Fri/Sat/Sun/Mon). Jet2 have added Chambéry & Geneva from East Midlands and to Grenoble from Manchester to their increasingly useful route network. Flybe look like they’re only flying to Chambéry & Geneva from Southampton & Exeter next Winter but plenty of non-direct flights via Southampton or Paris are available. Routes to Geneva from Jersey and the Isle of Man are also available. easyJet continues to dominate routes to Geneva with dozens of flights from all over Europe plus flights to Lyon and Grenoble. Add in the scheduled services from British Airways, Air France, Swiss, BMI etc and there will still be plenty of options in getting to The Alps. P&O Ferries’ second new €180 million ship the Spirit of France entered service in February. With capacity for up to 2,000 passengers, and three separate vehicle decks capable of carrying nearly four kilometres of traffic parked end to end, this giant ship joins her identical twin sister the Spirit of Britain in raising cross channel competition. Personally I like the fact the P&O are really very relaxed if you miss your scheduled time, no penalties and they just stick you on the next one even if you’ve a cheap advanced purchase deal – may not happen at busy times in Summer mind and we do have evidence that other ferries and the tunnel are pretty good too these days. Eurostar tickets for Winter went on sale at the end of July – half term tickets went on sale at £330 and then reduced to £169 the following day for some reason. Weird. Prices from £149 per person return - free carriage of skis, boots and boards. A new service to the Swiss Alps (not stopping at Geneva) via a change at Lille has been introduced but no confirmed news yet of further direct services that have been rumoured to Geneva or Lyon. More shared transfer options becoming available and with on-line bookings plus brokers being used to sell empty legs there is plenty of competition out there. However one of the bigger Alpine minibus operators Alp-Line.com went into liquidation on 13 June 2012 so there could be some shortages around the peak weekends next Winter – make sure you book early if you’re traveling on one of the peak holiday Saturdays. The La Tania based transfer companies are all taking bookings for next season and should have a few more vehicles operating next season - Three Vallée Transfers, Snowbound Transfers, Dazzle Transfers, Ski Magic Transfers, Ski Hame Transfers and new for 2013 Snow White Transfers. Three Vallée Transfers are introducing a new shared shuttle service to meet the daytime London Eurostar services at Moûtiers every Saturday and drop you right at your accommodation in La Tania and the Méribel Valley for only €20 per person each-way. 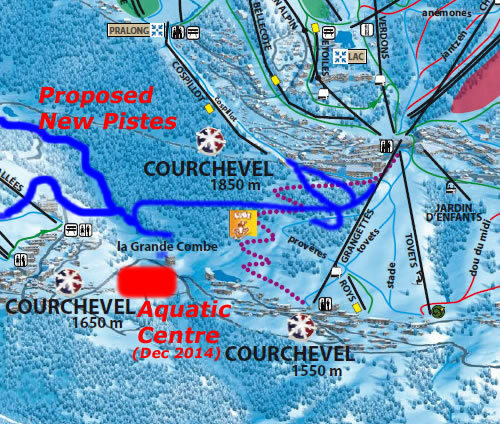 Hopefully this will be expanded to all parts of the Courchevel Valley for Winter 2014. Another new service for 2013 are Snowbound Transfers doing Monday to Friday shared shuttle transfers from Geneva and a special offer where under 5s ride for free - their "Lil Snowmates" promotion. 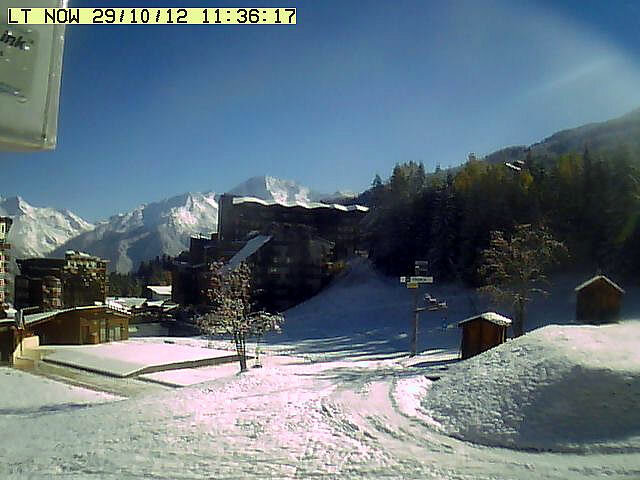 La Tania Winter 2013 lift opening confirmed as Saturday 15 Dec 2012 until Friday 26 Apr 2013. 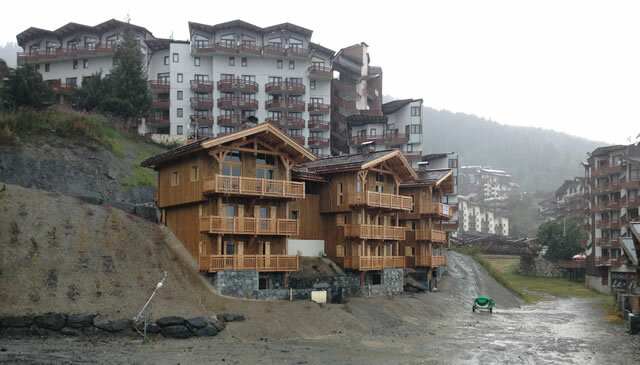 The building work near the gondola has finally been completed, no grass cover yet but trees and bushes have been planted on the banks next to the chalets. It will look fine when covered in snow (and there is a cannon right near the gondola station now to provide extra cover). 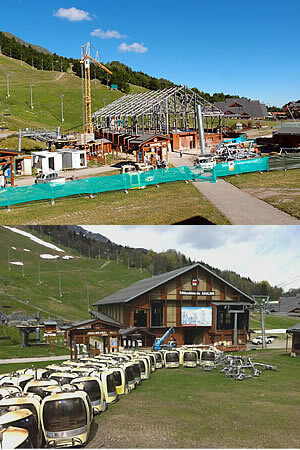 The public building and crèche is also completed (with secure outdoor area too) and the showers / changing room with left luggage lockers will be in operation next season – very useful for early and late departures when you wish to go skiing and have no accommodation, especially for Eurostar travelers getting in those “free” extra days skiing. 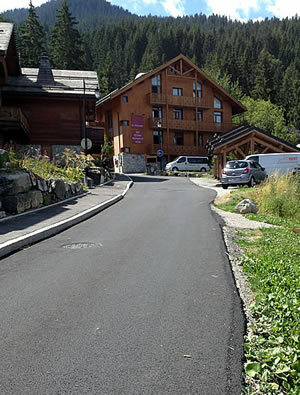 Some improvements to the La Tania infrastructure are slowly being made – the road up to Hotel Telemark and the Chalets area has finally been re-tarmaced, it was in a right mess after the snow of last Winter. The bridge over the piste is having the wooden planks replaced but there is plenty of painting and smartening up to do before next Winter (and the road down from the chalets to resurface!). New Poubelles for the rubbish and barriers to stop people parking or double parking seem to be the priority though! The Kalinka Apartment block is being smartened up with the rear access road re-tarmaced and the outer facade being repaired and re-varnished, see above. The terrace decking and railings outside Hotel Montana are also being replaced / repaired and re-varnished for the coming Winter. The 10 minute parking around The Sherpa Supermarket area are being enforced more and more (I got a ticket in a Swiss hire car last Winter that wasn't followed up – usually they are paid by the hire company and they charge your credit card plus an admin fee). UK cars won’t be chased for the fine, although you could get towed away if you repeatedly offend. We're not sure how much these restrictions are enforced in Summer however. Further chalet building continues to the far side of the resort near to the red run although no new land clearance as far as we can see. 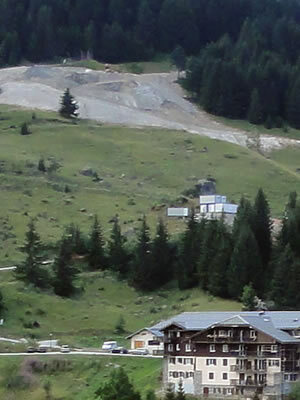 There’s no new work going on above the new chalets near the gondola next to the Grand Bois – but there are plans for more there and the ground was flattened last year. We were fooled by a couple of chalets being sand blasted - this took years of old varnish off and made them look like new. The Ski Magic Chalet Chalouis at the top of La Troika being one of them. Re-lined pool, new fences and a new Boules pitch this Summer. The new 3 Valleys Charity Day held last year in Méribel Village after the difficulties of staging such a size of an event in La Tania was a great success. Charity Day 2013 will again be held in Méribel Village with the date of Wednesday 10 April 2013 now confirmed. Snow Retreat have added 2 new 10 person chalets to their portfolio this season taking their total to 6 chalets, The Free Ride Republic have added Chalet Baikal 1& 2 next season and Chalet Rachael is now back with Alpine Escape. The Hotel Montana will be managed by Alpine Elements next Winter, they will also be doing long weekends and hope to promote the Summer season more with hiking and biking holidays. New doors on the Ski Lodge to keep the warmth and sound in plus new web cams inside and outside the pub. Great new Jäger shot glasses, but they won’t last long and Peroni / Magners continues to be the most popular pints. Sky HD installed everywhere now and expect quite a few new staff next season but plenty of old faces too. The Summer Moules & Frites and Fish n Chips nights continue as usual! The Hotel Telemark continues to offer flexible breaks and the restaurant is open to all, real ales are also now available. 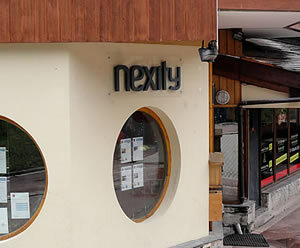 The Olympic Estate Agent next to the Ski Lodge has been taken over by the Nexity chain and has been re-branded accordingly. La Saucisse Savoyarde opened this Summer with their legendary Giant Tartiflette on Thursday evenings – expect more great home cooking, pizza takeaways, bacon sandwiches, baguettes, lasagne, rotisary chickens, raclette machines etc next season. La Ferme is also open this Summer providing that essential Fondue and Crepe fix when required as is the La Farçon Restaurant for the Michelin Star treatment. Sandy & Bruno passed their latest Chimney Sweeping exams and continue to clean the chalet chimneys of the 3 Valleys with Extreme Ski Services and provide the necessary documentation for insurance requirements. 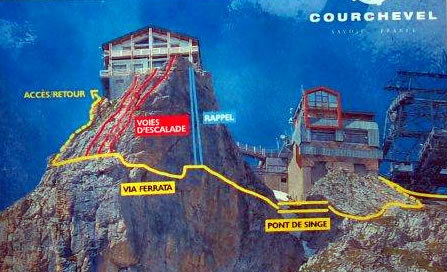 Courchevel 1850 Winter 2013 lift opening confirmed as Saturday 8 Dec 2012 until 26 April 2013. The re-naming of the Courchevel Villages remains as controversial as the last time they tried it when first developing the resorts – objections back then to “Lower Courchevel” lead to the approximate (and exaggerated) altitudes being used hence Courchevel 1300, 1550, 1650 & 1850. Some signage was already updated on the ski area last Winter – we didn't see that vandalised, but now the road signs at the entrance / exit to the villages are being changed there have been some signs defaced (and then replaced with a plastic type sign covering that looks like it can be easily swapped out). It remains to be seen how many people will start using the new names and there are a lot of road direction signs that haven’t been updated. Courchevel 1650 – Courchevel Moriond. Courchevel 1550 – Courchevel Village. Courchevel 1300 (Le Praz) – Courchevel Le Praz. La Tania remains La Tania by the way…. They wouldn't dare…. We revealed this at the end of April when we were tipped off by Greg H and it subsequently got copied everywhere else. 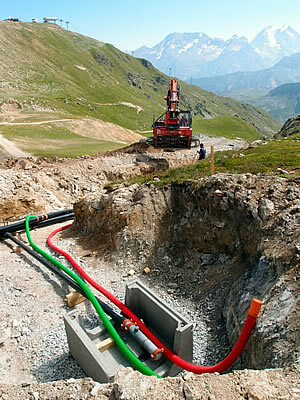 The Mountain Master Plan was tendered out back in 2010 by the Courchevel Mairee to look at the next 10 to 15 years of lift and piste infrastructure. The full plan is to install 16 new lifts and remove some 30 lifts (mainly drags and low capacity / short uplift ones) while keeping an existing 27 (there's currently 57 in the Courchevel Valley). The architects & designers estimate a cost of close to £80m for the entire Master Plan implementation over a 10 to 15 year period. 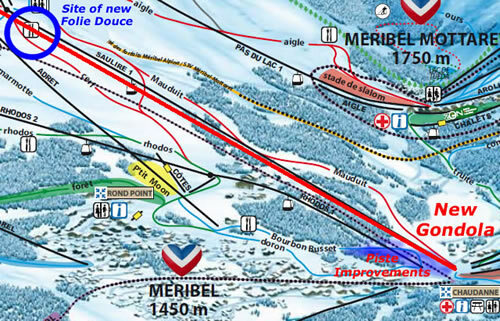 An amount that seems pretty conservative to us seeing as the new Méribel - Saulire lift has cost €20m on it's own and this is spread over up to 15 years in the future. 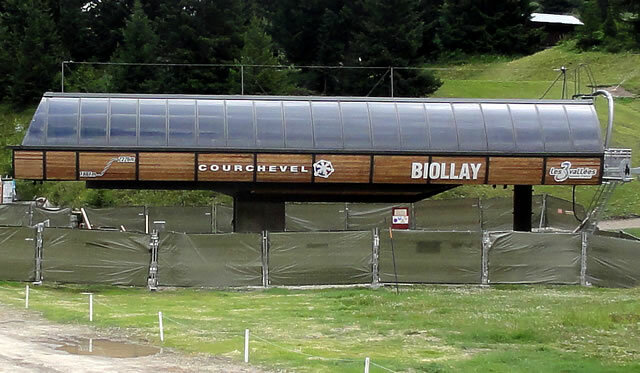 We already knew about the upgrade of Biollay to a 6 seater next season and the removal of the old 3 Vallees chair in Courchevel 1650 plus the addition of the Petit Moriond access gondola – see the next section. 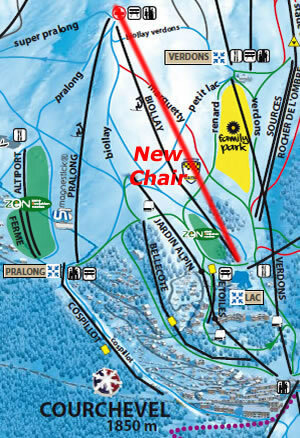 There were also rumours of a new Le Praz chair to the top of Cretes which is on the plan and scheduled for Summer 2014 - would certainly not be as storm proof as the existing gondola but would allow some great powder access for those first in the queue. 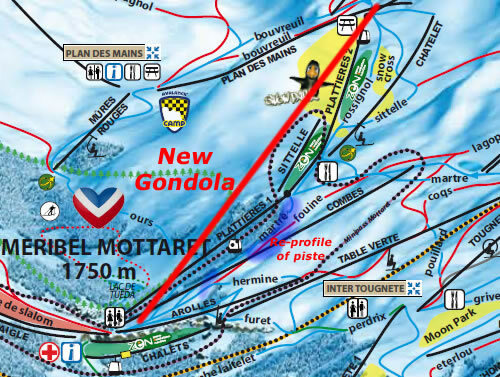 No sign of the rumoured La Tania chair from resort though and the drags are to be removed - although a new lift from the top of the La Tania Gondola is planned and a lift from Le Praz direct to the top of the La Tania Gondola is marked. 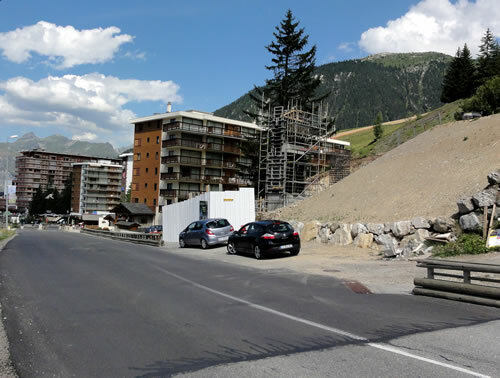 If the planned development of the car park near the La Tania Gondola goes ahead then surely further uplift from resort level must be mandatory before planning is given. See updates below too. Note the red lines are planned lifts, red dots are "alternatives", black lines existing lifts and black dots lifts to be removed. Blue dots are "potential" pistes. Also of note is a link almost direct from 1850 to 1650 and a lift from 1550 to St Bon & to the valley floor at Bozel - something else that's been rumoured forever but we’ve had confirmation from the Bozel Mairee that this will happen despite some objections that it will turn Bozel in to a “resort” town from the traditional village it is now. Above 1650 the Pyramid, Marquis & Combes drags get replaced with new gondolas and a chair in Summer 2013 plus there’s a planned piste from the Roc Mugnier / Fruit Junction area down the valley to 1550 proposed. 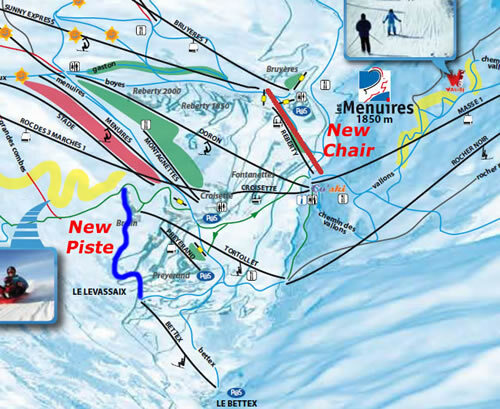 Elsewhere new pistes / skiing areas are proposed around Chapelets, Gravelles to the Chanrossa direct, on either side of the Creux Noirs chair and new Border/Ski Cross area near the (replaced) Sources & Rocher de L’Ombre drag lifts. 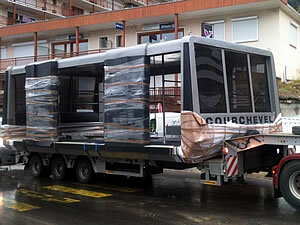 It is the most used lift in the Courchevel Valley with 1.2 million skier per season and the capacity will be increased from 2500 skiers per hour to 3300 skier per hour. The base station is in exactly the same spot but the top station looks like it’s moved slightly further up for direct access to Super Pralong and maybe to the bottom of the M piste. Good to see €7m being spent on one of our favourite lifts and meeting spots (I’m sure some people think it’s called “Biollay at 10” - you hear it enough at closing time!). 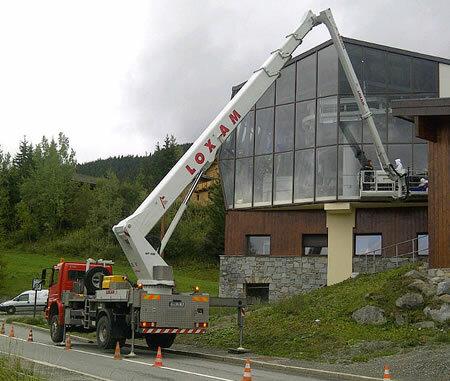 As the expansion of chalets around 1650 increases, the escalator up to the main road was put in to ease access to the ski area and this next step sees a short gondola being erected at the entrance to the resort at the 1850 end of the road to allow access to the Ariondaz gondola and the central "Front of Snow" area. As we understand it this is not the full replacement for the 3 Vallees Chair giving access to the Signal 6-man Chair as quoted on some other web sites. It's really just for access to the main 1650 area and is only 160m long with a vertical rise of only 50m. 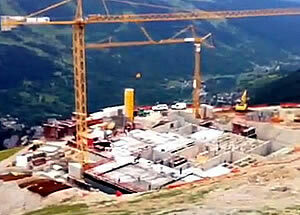 At the same time the old 3 Vallees Chair is being removed but a further 2 new gondolas (Ariondaz being replaced by a 2 stage gondola via the Belvedere area) are planned for uplift direct from 1650 with this work starting in Summer 2013. As with some of the plans for 1850, seems more effort is going in to give easy access from chalets rather than opening up more skiing. As we understand it, the new lift will be a 14 person stand-up gondola type of the "pulse" cable car system (one goes up while the other comes down) capable of 520 skiers per hour. The €3m lift is due to be completed by December 2012. As well as the usual drainage, erosion prevention and maintenance work there are new snow cannons going in down the Creux from Saulire and on Cospilot above 1550. Piste re-shaping work is taking place on the 1850 Stade (the Emile Allais Slalom Course for the Ladies World Cup on 16 December 2012) and around the end of Cospilot – this could be snow cannon work however. Verdons by Night Skiing: Every Wednesday from 21 December 2012 to 06 March 2013, from 6pm to 8pm. 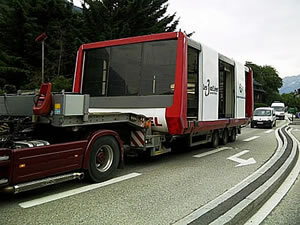 Verdons cable car will be open. Dynafit Ski Touring Comp: Every Wednesday from 12 December 2012 to 27 March 2013, a night mountaineering skiing race against the clock will take place from Le Praz to Courchevel 1850 (I used the old names there see?). BMW Polo Masters Courchevel: To be held at the Altiport on 01 to 03 February 2013. FIS Ladies’ Alpine Skiing World Cup Giant Slalom: 16 December 2012 On the Émile Allais slalom course (the Stade named after France's greatest skiing legend, racer and resort pioneer & designer Émile, who sadly died on 17 October 2012 aged 100). Work continues on this huge €50m centre with hotel, pools, slides, spa and even a surf wave machine. 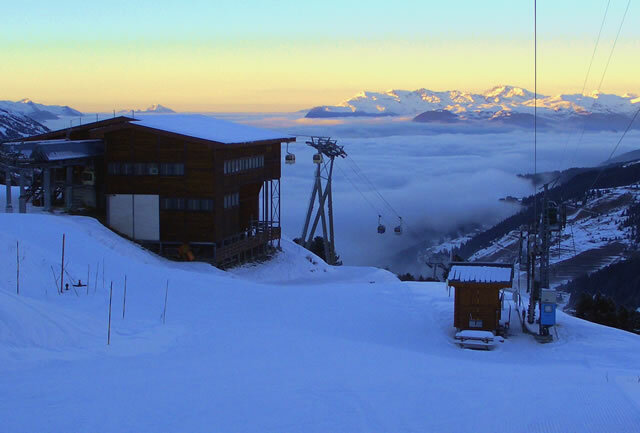 Opening is scheduled for December 2014 and a new piste and chair lift to / from this area below 1550 and 1650 is planned. Looks like the end of the snow karting for now unless a new venue is found. 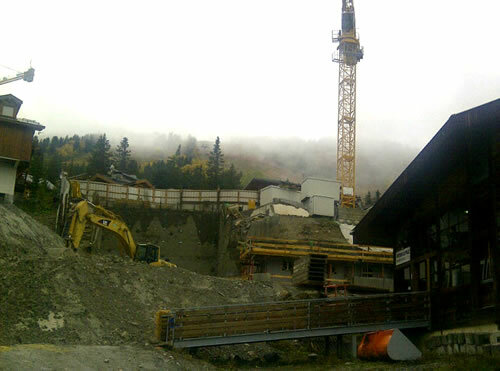 Construction has started on a new gym in Le Praz to the left of the landing area of the Ski Jump. You should get a great view of the jumpers while hitting that treadmill! Just about all of the modern chair lifts in the Courchevel area now have the Magnestick devices to "stick" kids to the chair lifts	using	electro magnets in small backpacks / bibs and on one seat back on the chair itself. 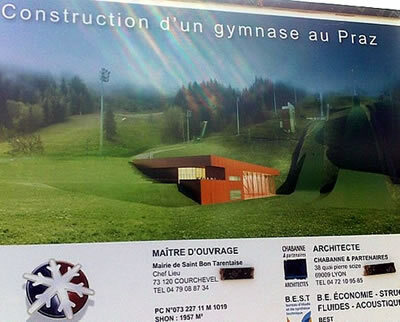 An extension to the Drop Inn chalet in Le Praz for those wannabe ski instructor Gappies is under construction. Work on replacing the Municipal Garages in St Bonn is taking place (this blocks off the popular snow chain fitting area just above St Bonn – but could be finished by Winter). Last season saw the new Hotel Le K2 open – top end luxury Chalet accommodation. Looks like there’s less major construction around 1850 this Summer but what is being built looks very expensive! 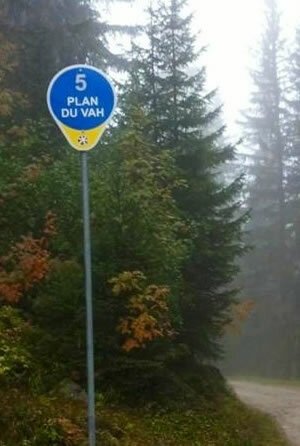 There’s a sign for “Le Resort Courchevel” too – but not sure where that is. One of the Saulire Cable Cars has been taken away for a refurbishment - our spies spotted it on the back of a lorry back in May! 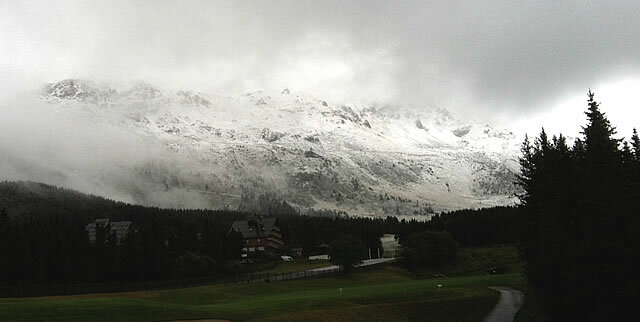 Mottaret and possibly some Méribel lifts expected to open from Saturday 8 Dec 2012 until 26 April 2013. 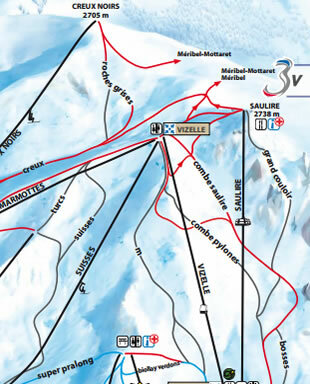 Méribel and Three Valley links are expected to open from Saturday 15 Dec 2012. This is the bottom section of the lift from Méribel Chaudanne to the top of Saulire. Express 2 was opened last Winter so when all completed it will take just 12 minutes to reach the top (and access the Courchevel Saulire powder long before 1850 residents!). Stats are 8 seater cabins, 2400 skiers per hour, 1250m vertical and total cost around €20m. 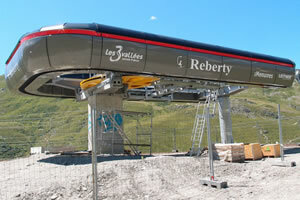 A new 10 (yes ten) seater gondola will replace the first 2 sections of the Plattieres bubble type lift for this Winter. The top Plattieres 3 bubble remains but this will be a major route to access Cote Brune to Val Thorens (the next bottle neck?). The bottom station is re-housed across the main piste area and journey time is quoted as 9 minutes instead of around 20. Capacity is 2800 per hour and the cost is €17m. There is a plan apparently to remove the 6 seater Adret lift below the Ronnie but there is a campaign to try and stop this led by business owners in this area. It has all gone quiet recently though – no news, unless you know different of course, let us know. As well as the usual drainage, erosion prevention and maintenance work there is some re-shaping and widening work on the runs in to Méribel Chaudanne and in to Mottaret centre to make it easier for beginners. We’re also informed that a Magic Carpet beginners lift in being installed in Mottaret centre. 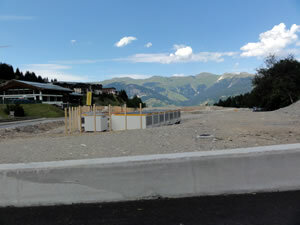 Some work is also being carried out on the Grand Duc piste related to the 2015 World Cup Finals being held in Méribel. As part of the preparations for 2015 there will be a World Cup round of the women's downhill and the downhill/slalom combined event over the weekend of 23/24 February 2013 (with training on 21/22 Feb). A new black piste has been created under the new Saulire Express 2 gondola along the line of Couloir Tournier we've been told. Some work must have gone in to this as it was always a fairly rocky entrance and being South facing gets a lot more sun than the couloirs on the Courchevel side of Saulire, also making it more prone to slides in the afternoon. However we hear that it will be set up as an expert zone with the now de rigeur social networking cameras to record your heroics. Not marked on the 2013 Piste Maps yet though. 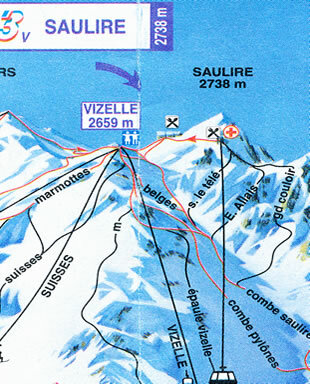 Good to see a new black run as 2 of the couloirs on the Courchevel side dissapeared from piste maps in 2002. See this year 2000 piste map below compared to the 2013 one. 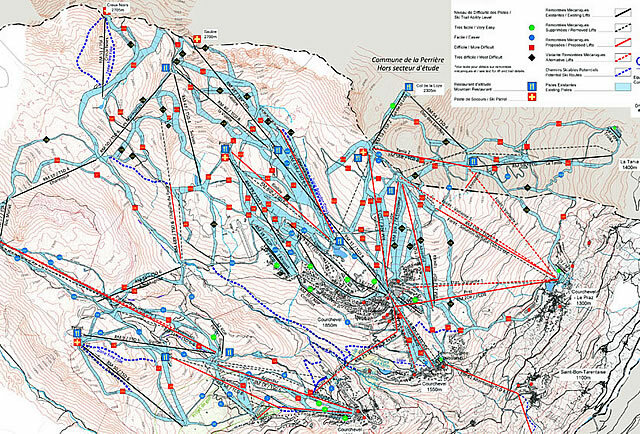 Piste Maps from 2000 and 2013. Note the Belges and Epuale Vizelle pistes have gone as well as the Emille Allais & Sous Le Téléphérique pistes and the new red run link at the top of the new Biollay chair is visible at bottom of pic. The first 5-star hotel in Méribel is due to open in December 2012 - this large construction in the centre of Méribel has caused quite a bit of disruption in the last couple of years so nice to see it's completion. 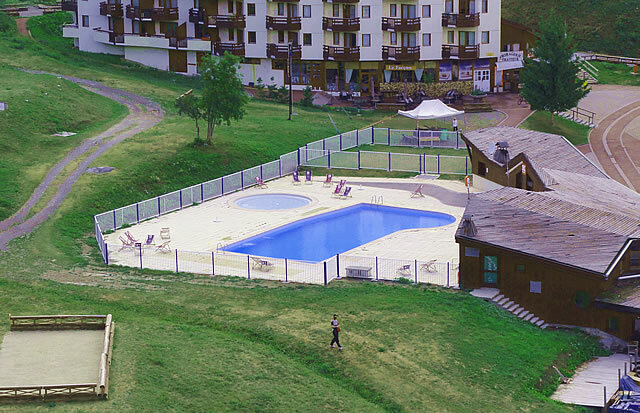 It only has 42 bedrooms, but comes with a large pool, sauna, whirlpool and spa area and keeps Méribel up with Val Thorens who now has it's first 5-star hotel, The Hotel Altapura. Courchevel 1850 meanwhile has 12 (twelve) 5-star hotels and 2 in the new "Palace Grade" - The Airelles and Cheval Blanc Hotels. There are only 8 Palace Grade hotels in France and only 4 outside of Paris. The much rumoured (and confirmed by the guys at their appearance at The London Ski Show) Méribel Folie Douce looks like it’s finally happening and major building and reconstruction work is being carried out at the old Choucas Restaurant just below the Saulire mid-station reportedly tripling it's size. It may be over hyped and over priced but it's certainly something of an institution in Val d’Isere and Val Thorens. 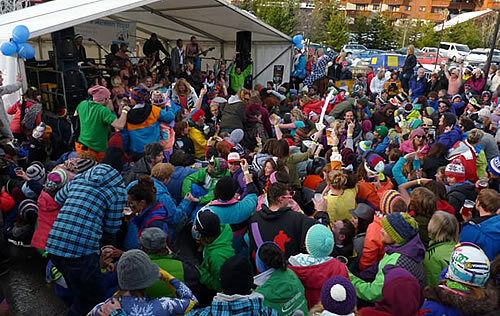 A huge sound system, DJs and dancers plus the odd singer and musician get a well oiled crowd dancing on the tables in their ski gear from around 3pm until (strictly) 4:30 every day. Often copied but never really matched anywhere else it will be interesting to see how this goes down in Méribel – bearing in mind it’s an afternoon thing and the Ronnie doesn’t really get going until 5 (and it’s on the way back) maybe it will take a while for those too cool for school Saisonnaires to catch up and pay up – and you can’t get a bus there! Last season a bottle of Veuve Clicquot Champagne was €140 at La Folie Douce in Val Thorens while only €50 at the slope side Hotel Courcheneige above 1850 (music was rubbish though!) while Saisonnaire bottles of Prosecco were €22 at the Rond Point. Whatever, another addition to the Méribel party scene has to be good news and you don’t need to ski to it or past it if you don't want to. The Cerf red run may be carnage at 5pm every day especially when it ices up – the pisteurs are gonna love that! 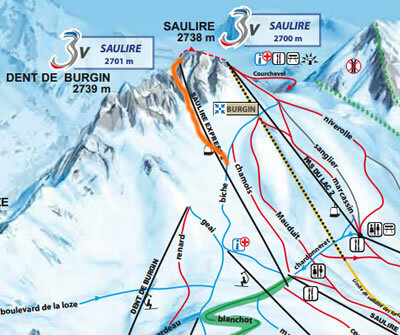 It will be interesting to see what access to the new Saulire Express gondola and/or blue run are like - maybe there'll be a back entrance straight in to the Gondola station. 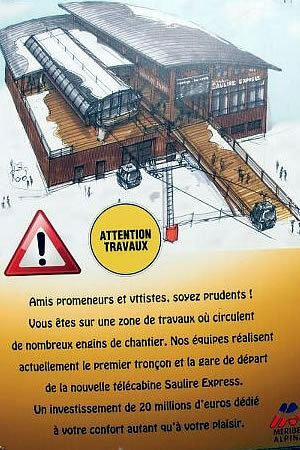 Val Thorens Winter 2013 lift opening confirmed as Saturday 24 November 2012 until Sunday 5 May 2013. 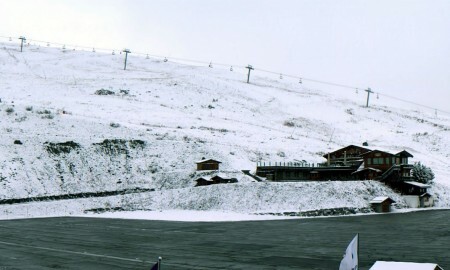 Val Thorens is scheduled to open on 24 November 2012 snow permitting. Amazing how they only opened a couple of days late last year with no real snow. The cannoned stuff laid on a few km of piste until the deluge a couple of weeks later. As spotted by Nick last season when he noticed new pylon foundations had been constructed. This new “6-pack” a high speed, detachable (slow boarding/exit), 6 seater chair replaces the old Reberty “bucket” type lift and will have a capacity of up to 2600 skiers per hour. 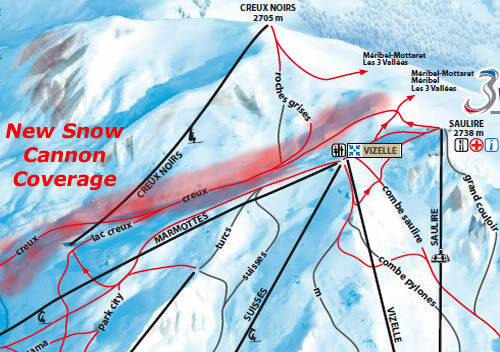 It will provide an alternative lift back from the La Masse area and direct access to the Sunny Express chair and Bruyeres Gondola for getting out of Les Menuires. This short new piste has been created to ease traffic from the centre of Les Menuires and La Croisette area. It will help by taking skiers off the long traverse Gros Tougne piste as it approaches Les Menuires towards the top of the Bettex chair lift where they can join the original Bettex piste. 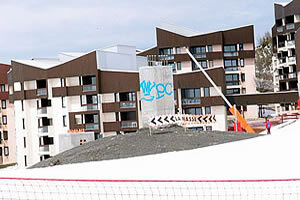 Val Thorens will hold the first European stage of the ISF World Cup on the 18 and 19 December 2012. Great news for Val Thorens and well worth watching if you get the chance – brilliant for spectators, there's a crash in nearly every other race. 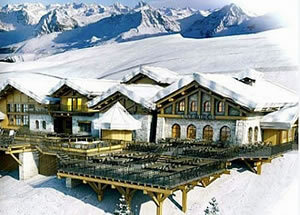 A lot of focus on the new hotels and developments like the Hotel Altapura (awarded a 5-star rating after it's first year) and Le Hameau du Kashmir with the Tourist Office web sites boasting about the new 4-star ratings for l'Ours Blanc, Chalet-Hôtel & Spa Le Menuire (new indoor pool and spa/water relaxation park), Hôtel Les Bruyères and Residence de Tourisme "Le Chalet du Mont Vallon Spa resort". 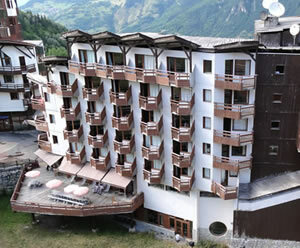 Certainly a focus in the 3 Valleys around top end accommodation - see the new Kaila & Spa by Nuxe 5-star hotel in the Méribel section above due to open in December 2012. 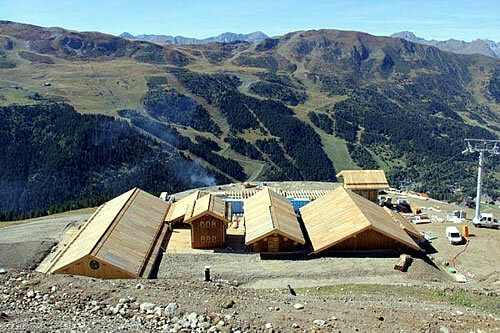 Chalets Cocoon and the Chamois Lodge are other new top end accommodations around St Martin De Belleville. 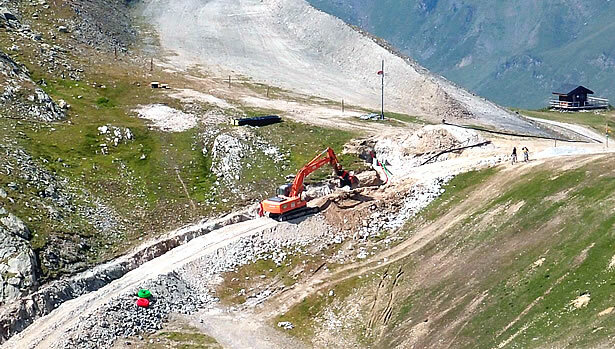 A dedicated DVA park with buried connected hidden transmitters at the top of the Roc des 3 Marches gondola has been created to enable people to practice and be instructed in how to use avalanche transceivers and search for victims using a shovel and probe. Following on from the Méribel Area 43 Snow Park and the camera system they have set up there, Les Menuires have set up a free video system on Zone 1 of the BK Park at the top of the Becca chair. You login to the terminal at the entrance of the BK park with your ski pass – then an automatic video of your visit is taken with several cameras and you can watch yourself on a screen at the bottom of Zone 1. You can also receive your free video set to music via MMS and share it on Facebook and Twitter. 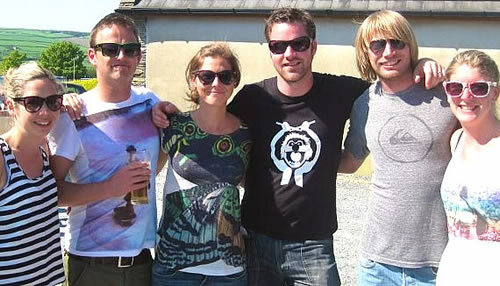 Hotel La Bouitte in St Martin de Belleville is organising meals based on the theme “the greatest wines in the world”. These events will have seriously top winemakers presenting a selection of their greatest wines accompanied by carefully selected dishes to enhance the wine tasting experience. 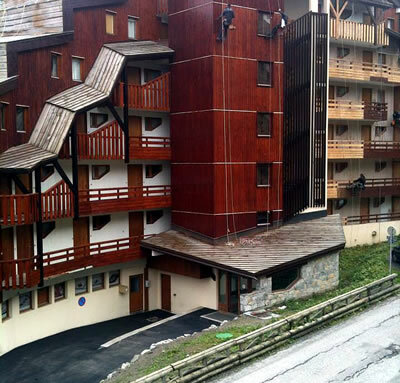 We hear via SkiMottaret.com that the 18-bed Refuge du Saut is being renovated. This is situated a couple of hours hike in Summer or maybe a few more getting there on skins in Winter from Mottaret. It's along and up out of the valley from Lac de Tueda (blow the flattish Ours piste on the lower route back from Mont Vallon) through the Plan de Tuéda Nature Reserve and up and along the boundary with the Vanoise National Park. Sound like a plan for next Winter, the 2 refuges in Vallée Des Avals above Courchevel 1650 would appear to be a lot easier to get to - Refuge des lacs Merlet and the larger Refuge du Grand Plan (which now has WiFi apparently!). A latest trawl through the minutes of the Mayor and local council leaders saw the Courchevel Mountain Plan going through the approvals and commitments to the different stages - 1650 seeing the new investment first and the new 2 stage Ariondaz Gondola having a clause saying that there would be 6 days a week Summer opening - good news! Some agreement on the free ski bus between Courchevel and La Tania looks like it's been made with the different Communes and S3V part funding it through until 2030. No mention of a Méribel Service though. Other than that - fishing permits, car parking and traveling expenses are going up plus there's a new building at the 1850 Altiport to house 6 helicopters plus a bar/restaurant area planned. Still trying to find out information on what will happen if they remove the La Tania drag lifts - looks like the ok will go through for the new Le Praz lift to Chenus and then ultimately a lift to the top of the La Tania gondola and a new chair to the ridge. We also hear that the new Bouc Blanc to the summit chair has been approved. Further update: It does look like an alternative route up the mountain will go ahead to compensate for the removal of the Gros Murger drag - rumours on some of the forums now, we'll keep our ear to the ground on this. 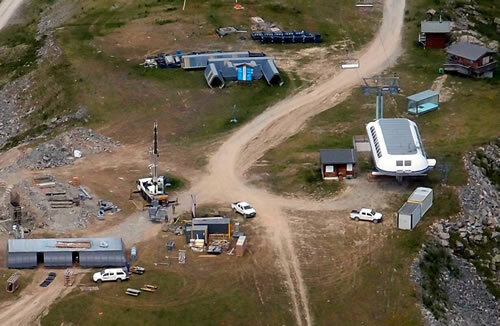 Replacement of the original Péclet Funitel cabins (see above the new cabins waiting to be installed) with cabins of 19 seats instead of 12 plus the addition of 9 new cabins. This will increase capacity to 400 skiers per hour. 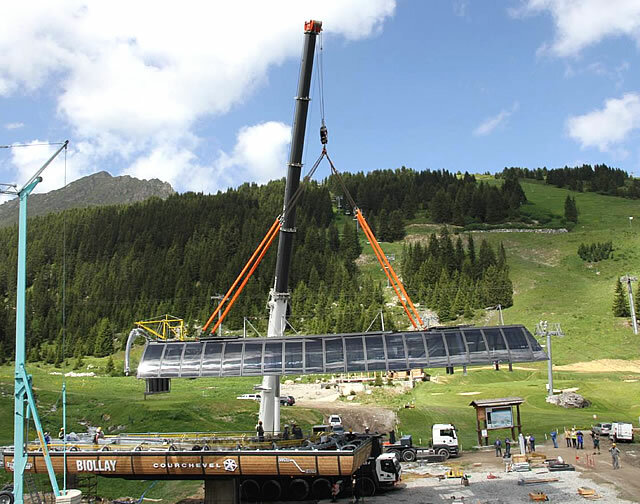 Replacement of the Portette chairlift with a higher capacity and more wind proof lift. 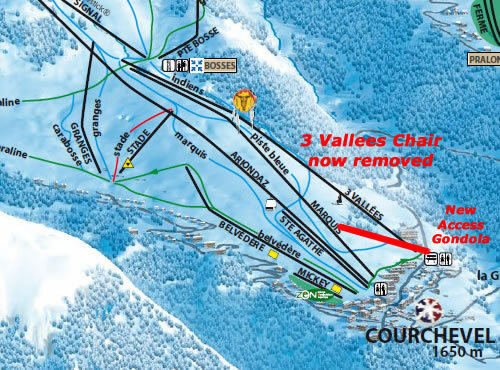 Replacement of the 3 Valleys 1 chair with a high speed detachable chair - increasing capacity by 800 skiers per hour and also the 3 Valleys 2 chair to be modernised with a 400 skiers per hour increase. 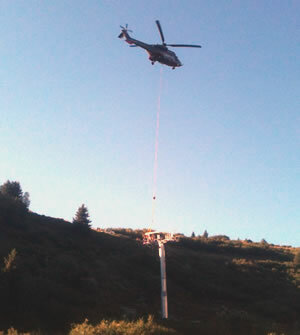 Replacement of the Peyron chair to a high speed detachable in the "4th Valley" Orelle sector. The very useful Plan de L'eau chair that links you back in to the Val Thorens area after the Vallon du Lou off piste runs down from La Masse is to be replaced by another high speed detachable chair but extended all the way up to give access to the Cime Caron cable car. An additional 800 skiers per hour on the capacity of this lift. Upgrade of the 2 Lacs fixed chair to gain an additional 400 skiers per hour capacity. The general modernisation program will see improvements to the Southern area, above La Folie Douce (promoting more "Sunny Side" skiing), the 4th Valley and the busy Plein Sud area that links back to the 3 Valleys. 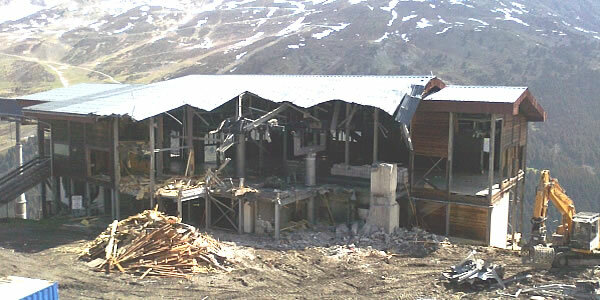 Once completed this will only leave 3 old fixed type chair lifts in the Val Thorens domain (the high up Col, Glacier and Bouchet chairs). Most of these projects are still subject to the necessary approvals processes at this stage but thanks to Mark S for the updates and pic. Website will be on-line soon and the facebook page can be found here. New for Winter 2013 - hdr3ntals supply high definition equipment: Large flat screen TV's, Games Consoles and GoPro Action Video Cameras to rent during your stay in The 3 Valleys. A new concept in dining with former World Sommelier of the year Enrico Bernardo and his restaurant Il Vino (there's also one in Paris). The new Plan Du Vah Piste Markers have been spotted by Mark E.
It looks like the new Piste goes as far as the road between 1650 and 1850 - Our guesstimate of the line of the new route is above in blue (and in gray is the ultimate destination to La Grand Combe near the new Aqua Centre in Courchevel 1550 which is just off the map in the bottom right hand corner). Building work continues apace on the new Folie Douce in Méribel (see above) - still a bit to do before the snow comes but looking good for afternoon entertainment before the Ronnie kick off - long Aprés sessions in prospect... The 3 Valleys Association is having a big party in London on 15th November with The Folie crew performing so hopefully we'll get some more info then.